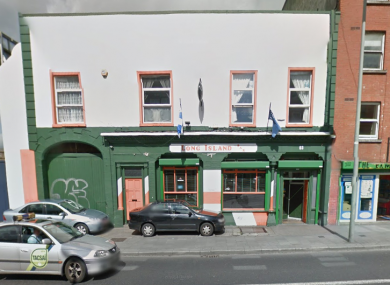 Long Island Bar on Dorset Street was accused of showing two matches without a proper licence. The Long Island Bar on Dorset Street. A JUDGE GAVE one of Dublin’s most famous pubs a red card yesterday for the unlawful showing of live Premier League soccer matches. A Sky UK manager, Karen Anderson, told the Circuit Civil Court that the Long Island Bar, also known as Joxer Daly’s, in Upper Dorset Street, Dublin, did not have a Clubs and Pubs Licence to broadcast live sport. Barrister Gareth Hayden, who appeared with solicitors Eugene F Collins for Sky UK, told Judge Jacqueline Linnane that Edward Walsh, who trades as Long Island Bar and Joxer Dalys, had infringed Sky’s broadcasting copyright. He said Sky had acquired the exclusive rights for the broadcast of live sporting events, in particular English Football Association Premier League matches. Mr Hayden said live sporting events were transmitted in an encrypted format and clubs and pubs licenced by Sky would receive a card for unencrypting the signal and broadcasting the events on their premises. A private detective who visited Walsh’s pub on two occasions said he had witnessed the unlicenced broadcasting of Premier League matches. On 2 November, 2014 he watched, with pub customers, part of a match between Manchester City and Manchester United. A month later he had seen Manchester United beat Spurs 3 – 0. He said that unlike television sets in Sky licenced premises, the television in Walsh’s pub did not show the “pint glass” icon at the bottom right of the screen denoting that the broadcast was legal. Mr Hayden told the court that despite having been written to on several occasions Mr Walsh had failed to take out a licence or to pay an outstanding royalties demand of €11,340. Tim Dixon, counsel for Walsh, opposed any award of alleged arrears on the basis they had not been proved in court. Judge Linnane granted Sky a permanent injunction restraining Walsh from infringing its copyright in broadcasts of live sporting events. Awarding Sky its legal costs the judge said she would make no order as to damages or arrears as she had not heard any proof of loss. Email “Dublin pub loses case after showing Premier League matches without proper licence”. Feedback on “Dublin pub loses case after showing Premier League matches without proper licence”.